Clone Wars in the theaters, Clone Wars on your TV, and now Clone Wars on your tabletop. A new expansion for the Star Wars miniatures game is coming out on October 31, with 40 characters drawn from the animated movie and TV series. We've got top-secret details on the new minis, plus an exclusive sneak preview of Commander Gree, including his full stat card. Commander Gree was originally a clone with the designation CC-1004. He participated in many engagements throughout the Clone Wars as part of the 41st Elite Legion. His experiences on diverse alien worlds led him to develop his special talent for cooperating with whatever race or species he and his soldiers found themselves with. At the Battle of Kashyyyk, the Supreme Chancellor ordered all Jedi killed. Following orders, Gree tried to kill Yoda, but... well, Yoda chopped his head off. Costing only 20 points, Gree deals a hefty amount of damage, but his "going native" commander effect is his true strength. Throw together a wookie, a droid, a few clones and a Jedi, and they'll all work together as a finely trained team as long as they stick together. Gree gives you a lot more options when building your force. 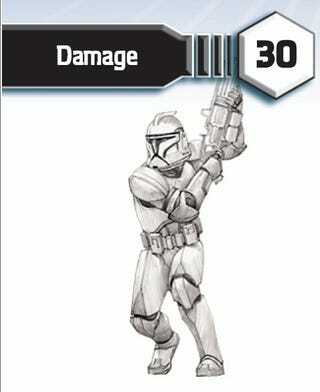 We can confirm that Durge, Asajj Ventress, and Captain Rex will be represented in the set. In addition to random booster packs, Clone Wars miniatures will come in starters featuring the full rules and six pre-set figures. In November, the Clone Wars Battle Scenario will be released. This set will contain ten preset figures, including five that are exclusive to the Battle Scenario: Roron Corobb, Dwarf Spider Droid, IG-100 MagnaGuard, Clone Trooper on Speeder, and IG Lancer Droid. The figures and rules included will let you have a battle right out of the box. Images by: Wizards of the Coast.